Stitch'n Sew Cut-Away Stabilizer - THERMOWEB-Stitch'N'Sew: Stabilizer. 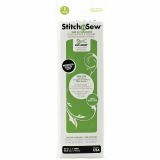 This sew-in cut-away stabilizer is a great choice for knits and mid-heavy fabrics because it resists pulling or sagging and continues to stabilize the embroidery and fabric through laundering. This package contains 1 yard of 20-inch wide non-woven medium weight stabilizer. Machine washable, machine dryable, dry cleanable. Made in USA.